What do you do when you're depressed because you just found out that you failed in one subject in school? Watch Jack Black and Mos Def. Basic plot: Mos Def works in a video store owned by Danny Glover. This store rents out VHS, not DVDs. Danny Glover leaves town, putting Mos Def temporarily in charge. By some freak accident, Jack Black erases everything in the video cassettes. Everything. So they get a video camera, and make their own version of the movies they erased. That's actually the whole meat of the movie. 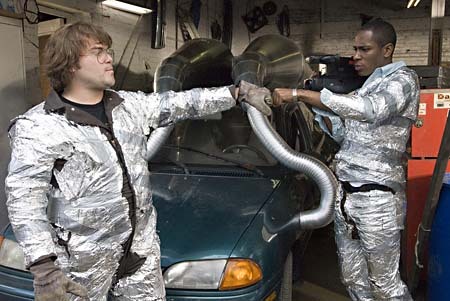 Just imaginge them doing Ghostbusters using crappy special effects, and Jack Black and Mos Def playing all the parts. Including Slimer. And how they used real marshmallows for the Marshmallow Man. They actually did this for a lot of films. Like Rush Hour 2, where Mos Def of course plays Chris Tucker. They also did it for Robocop, with Jack Black playing the crappiest Robocop I've ever seen. They actually have a term for this now. It's called "sweded", which Urban Dictionary defines as "[t]he summarized recreation of popular pop-culture films using limited budgets and a camcorder." Writer-director Michel Gondry, however, fails to sustain the comic tone of the film, and turns a bit serious towards the end. It kind of reminds me of Cinema Paradiso, but this one uses a more modern approach. The last hurrah of the analog age, so to speak. Before we all embrace the convenience of DVDs, we need to revisit the magnetic medium, because VHS tapes are what made home viewing fun. For the young'uns who never knew the feeling of seeing "12:00" on your VCR, you'll never know what you've missed. One can't relive nostalgia if it isn't there in the first place. Anyway, the Sweded scenes are the funniest scenes in the movie, and I promise it'll be an LOL moment, especially if you've seen the original movies before. And it is already a proven fact that comedy can indeed alleviate depression, even for just ninety minutes or so. Ah, the magic of movies. And to end it, here is part of the Ghostbusters Sweded scene, from the Rotten Tomatoes MySpace page. Be Kind Rewind. USA. 2008.
so that explains what the hell they were doing in the trailer for this movie... i was wondering why they were mimicking a movie i immediately recognized but whose title i can't recall just now. XP hehe. you picked just the right scene from the movie as a teaser XD the sparkly christmas wreaths are just precious. even if i didn't get to watch the original ghostbusters movie in its entirety, i remember bits of it and this parody is just fricking hilarious. XD omg. try to catch it on HBO, it's on this month i believe. i love jack black. he is a very intelligent comedian, although off-beat sometimes. haha.